As Charlton Heston put it: ‘There’s a temptingly simple definition of the epic film: it’s the easiest kind of picture to make badly.’ This book goes beyond that definition to show how the film epic has taken up one of the most ancient art-forms and propelled it into the modern world, covered in twentieth-century ambitions, anxieties, hopes and fantasies. 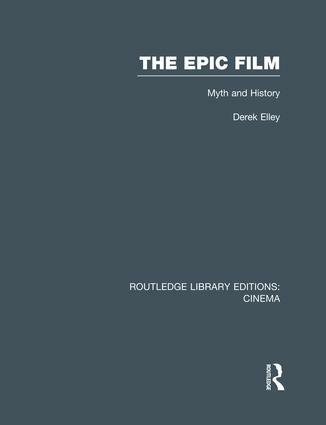 This survey of historical epic films dealing with periods up to the end of the Dark Ages looks at epic form and discusses the films by historical period, showing how the cinema reworks history for the changing needs of its audience, much as the ancient mythographers did. The form’s main aim has always been to entertain, and Derek Elley reminds us of the glee with which many epic films have worn their label, and of the sheer fun of the genre. He shows the many levels on which these films can work, from the most popular to the specialist, each providing a considerable source of enjoyment. For instance, spectacle, the genre’s most characteristic trademark, is merely the cinema’s own transformation of the literary epic’s taste for the grandiose. Dramatically it can serve many purposes: as a resolution of personal tensions (the chariot race in Ben-Hur), of monotheism vs idolatry (Solomon and Sheba), or of the triumph of a religious code (The Ten Commandments). Although to many people Epic equals Hollywood, throughout the book Elley stresses debt to the Italian epics, which often explored areas of history with which Hollywood could never have found sympathy.